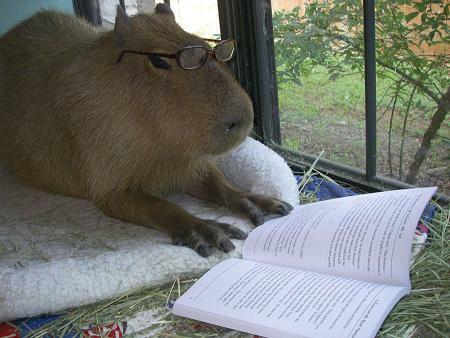 It’s no secret that Mountain Kids Fantasy (MKF) loves animals, and that the capybara is perhaps the best animal of all. What you may not know is that animals love MKF! In a recent interview on www.kittysneezes.com, capy-celebrity Caplin ROUS names Mountain Kids Fantasy as his favorite band! Not only was this a wonderful surprise and a heartwarming moment, it also signals a new trend in the music industry. Pets are the perfect consumers. They have no rent or mortgage to pay, they don’t own cars, and they don’t have to support their own offspring. In short, all their income is spent on entertainment, which means that MKF is a step ahead of the game in courting their affections. More bands should think about mining this rich territory. There are millions of cats, dogs, and birds, to name but a few, on the interwebs. They listen to music as much as the next person. Write songs about them, or at least feature them in your liner notes. I, for one, welcome our new rodent audience. It is good that our rodent audience starts with the world’s largest rodent, and the most famous world’s largest rodent at that. Hopefully we can work our way down through beavers, chincillas, guinea pigs, hamsters, lemmings, naked mole rats, porcupines, prairie dogs, mice, rats, and squirrels down the road. I’d love to work on the marsupial demographic. We need to hire some canvassers.